In Napa, a custom menu of apps helps a frequent traveler keep track of security—and his garden—from afar. To install Charles Willson’s prefab house, Stillwater Dwellings lifted the structure over an existing barn on the one-acre property. Willson, who is often on the road, wired the house with the latest in smart technology. The property includes a rental unit and several outdoor living areas. Landscape architect Josh Chandler installed a 13-by-61-foot bocce court alongside Russian sage and caper plants. A glass slab bench, embedded with LEDs, lights up at night. 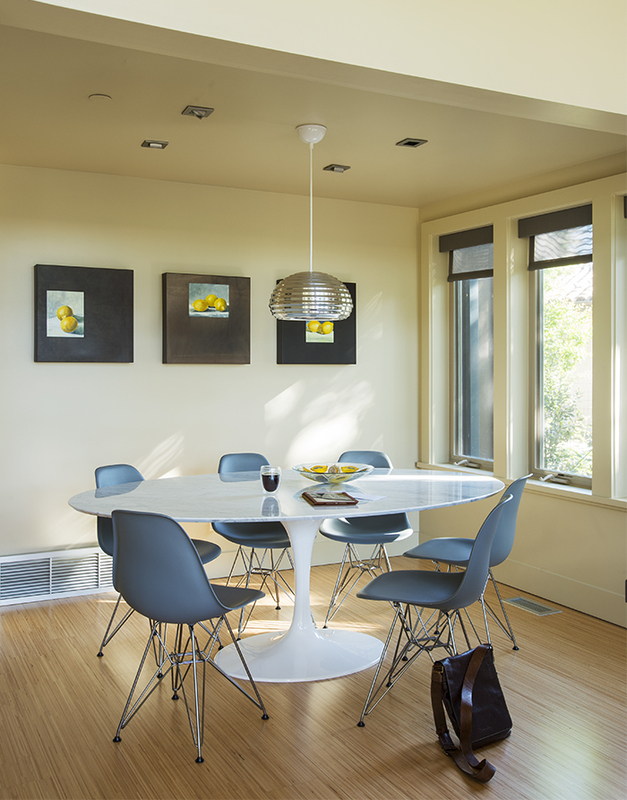 Inside the prefab residence, molded plastic Eames chairs from Design Within Reach rest beneath a Splugen Brau pendant light from Flos. Pam stools from Ligne Roset pull up to the kitchen island; the custom birch cabinetry complements a Caesarstone Raven countertop. 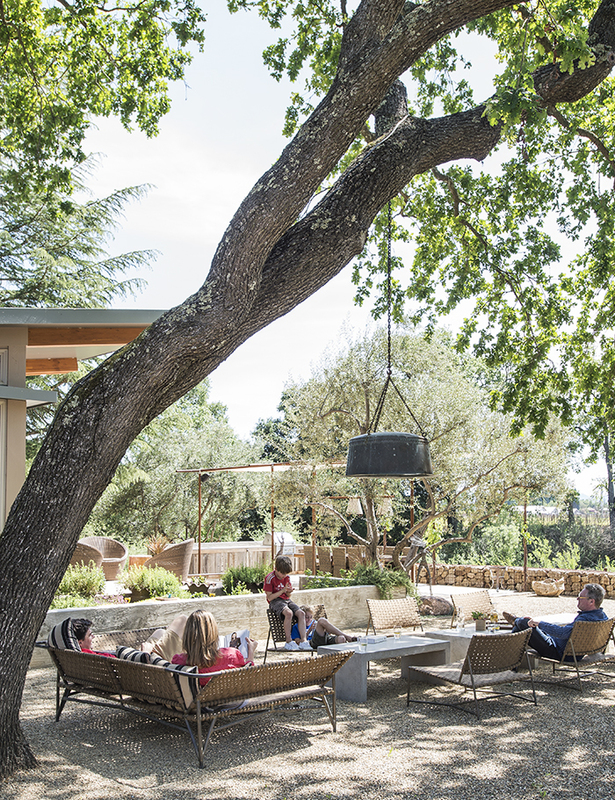 The living area opens up to a patio with views of a neighboring vineyard. Paulistano armchairs from Design Within Reach and a Ligne Roset Togo sofa surround a Dunn coffee table from Room & Board. The fireplace is from Montigo. Willson uses Edyn, a smart garden sensor, to track moisture, temperature, fertilizer, and sunshine levels. It automatically updates irrigation patterns based on its findings. An outdoor dining area is shaded by a mesh canopy suspended by old drilling pipes. A variety of drought-tolerant plants cascade down a 10-foot-wide vertical garden wall near the entrance to the property. Netatmo Weather Stations monitor climate changes in various areas and deliver warnings if the temperature gets out of range. Dropcam cameras with motion detectors are installed throughout the property. Willson also uses them to manage beer and wine fermentation remotely. Canary cameras detect motion and send Willson alerts with a video clip of the activity. From the app, he can summon law enforcement if desired. When Willson is within 30 miles of the house and the temperature is below a certain level, his Nest Thermostats are programmed to heat it up to 70 degrees. Charles Willson travels from his home in Napa, California, to San Francisco and New York City every week for work, but in a way he never really leaves. When he’s across the country or even in the air, a bevy of smart technology systems ping him with updates on his iPhone and iPad. “I’m on a flight and it’s lighting up, saying, hey, somebody’s walking down your walkway,” Willson says. He can immediately pull up his Canary or Dropcam cameras to take a look. “It’s probably the UPS man,” he says with a laugh. Willson, who consults for pharmaceutical companies on marketing digital innovation, is what you might call a tech junkie. His one-acre property is outfitted with systems that allow him to control security, climate, lighting, and irrigation remotely. “It gives me incredible peace of mind to be able to know if someone has walked around the property,” he says. He even uses cameras, along with a Netatmo weather station, to keep an eye on the beer and wine making he’s picked up as a hobby. The beer needs to stay at 65 to 70 degrees when it’s fermenting, so Willson receives alerts when it gets out of range and can adjust the temperature on the vats. Will motion detectors and the ability to sound an alarm to scare away intruders—a feature that Canary offers—stop a robbery from happening? Maybe not. “I think it’s a big difference for me to be able to know if something’s wrong immediately,” Willson says. The downsides of this level of connectivity are constant notifications and the occasional false alarm. Three invisible geo-fences update security, heating, and lighting depending on Willson’s location, so he receives more notifications when he leaves the property and less on site. His Nest Protect smoke detectors occasionally mistake dust for smoke, however, which has led to a few disconcerting alerts. The technology systems help connect the various areas of the property. When Willson purchased it, the space consisted of a nondescript house and barn with an unruly vineyard in the backyard. 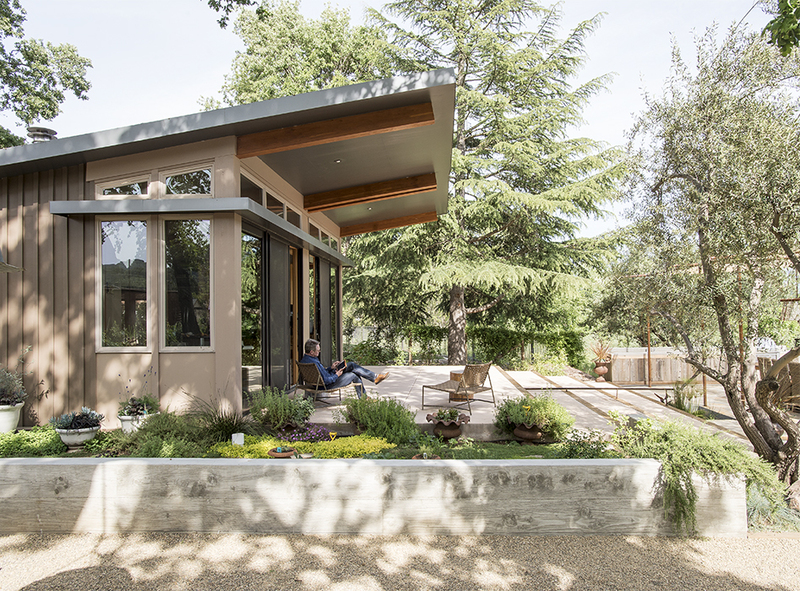 He hired a team to clear the plantings in the yard, which now houses the 1,200-square-foot prefab by Stillwater Dwellings where he lives. The existing house hasn’t been touched, and serves as a rental property—Willson has plans to knock it down and install a new prefab house in its place in the future. The barn, a dated red model with a shingled gambrel roof, received six inches of foam insulation and a new cladding of Cor-Ten steel and corrugated tin found on Craigslist. It now houses a workshop on the ground level and an apartment for guests upstairs. To develop the master plan for the site, Willson hired landscape architect and contractor Josh Chandler. He knew he wanted to work with Chandler when he expressed a similar vision for the property. “Josh comes up and says, ‘Don’t have them knock [the barn] down, I can reuse corrugated tin on the roof!’” Willson recalls. “And I said, I found my guy!” On the execution, Willson decided to act as his own general contractor, working closely with one builder and enlisting Chandler’s help on certain projects, such as the gabion walls and bocce court. Willson worked with architect Matthew Stannard, who founded Stillwater Dwellings in 2008, to fine-tune the cottage that would become his own residence. He was drawn to the ease of modular building but wanted something that would showcase the adjacent vineyard, which led him to Stillwater’s site. “We try to get the indoor-outdoor balance right,” Stannard says. Willson settled on the sd121 model—the firm’s most popular design—which has two bedrooms and an open-plan living and eating area. “I remember almost trying to cajole Charles to come and visit a Stillwater home before he bought one, but he was adamant that he didn’t need to,” Stannard recalls. “He was very sure of himself about it.” Willson opted for a version with a higher ceiling, and the two agreed to expand the size of the bedrooms, adding 200 square feet to the house. “It was a flawless process,” Willson says. “I grew to completely trust in Matthew’s decisions.” The structure was manufactured in Utah and installed on site in six weeks. The property uses Nest thermostats to control heating, Sonos for sound, and Belkin WeMo switches for light. All systems speak to each other through IFTTT (If This Then That), a service that allows users to designate actions to be taken when certain conditions apply. “If the nighttime temperature drops below 35 degrees, the anti-frost light turns on in the orchard and the chicken coop warming light goes on,” Willson says. The installation of the technology on site was surprisingly simple. Stannard’s team had worked with Nest thermostats before, and they ran special cabling for the high-definition TV. They also added outlets to support cameras as well as wireless routers. Willson handled the rest of the setup after construction.